Mass Pike to exit 2, (Lee exit), to route 20 west and route 7 north. Follow route 7 north thru Lee, Lenox and into Pittsfield. On your left will be Pontoosuc lake, just after the lake you will enter Lanesborough. Stay on route 7 north about 2 more miles looking for small old cemetery on your right. Take the next right onto Summer St. Follow Summer St for about a mile until you hit a "T" in the road, a pond will be directly in front of you. Take a left, drive about 300 yards, Lansen Mold will be on your right. Mass Pike to exit 2, (Lee exit), to route 20 west and route 7 north. Follow route 7 north trough Lee, Lenox and into Pittsfield. On your left will be Pontoosuc lake, just after the lake you will enter Lanesborough. ? mile after the lake you will hit a traffic light, take a right onto Berkshire Mall Rd. Follow the Berkshire Mall Rd straight thru to route 8. Take a left onto route 8 north; stay on route 8 for about 2 miles. Watch for a small white church on your left. Just in front of the church is "Old State Rd", take the left onto "Old State Rd". Drive about 200 yards, Lansen Mold will be on your left. Route 2 west into Charlemont. Take a left onto route 8A south. Take 8A south to route 116 west, (right onto route 116). Follow route 116 into Adams, take a left on route 8 south. Follow route 8 south, Cheshire Lake will be on your right. Just past Cheshire Lake you enter Lanesborough. After the sign "Entering Lanesborough" watch for a small white church on your right on the corner of route 8 and "Old State Rd". Take the right onto "Old State Rd". 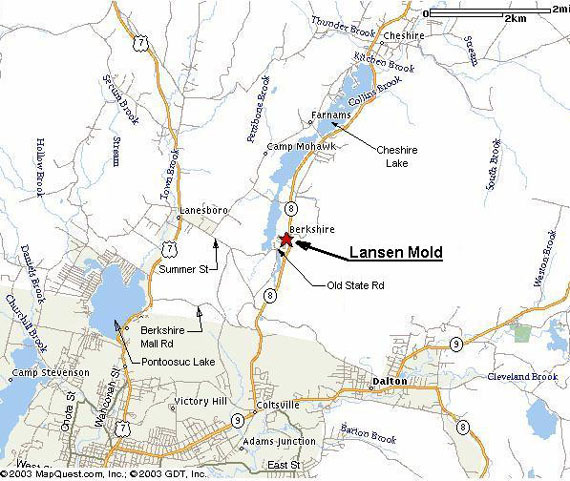 Lansen Mold is on the left about 200 yards down "Old State Rd".